Frankie Edgar has never really been a “star.” He’s not going to get people turning out in droves for a press conference, a weigh in or a media appearance, and he’s not the kind of guy that the UFC can send on a chat show, safe in the knowledge that he will move a few thousand extra pay-per-view buys. He doesn’t have a highlight reel of finishes and he can’t cut a promo, but it is a safe bet that ten or fifteen years down the line Edgar’s fight film is going to be the stuff that MMA’s top coaches force their charges to study. A force in two weightclasses and undersized in both, Edgar has beaten top tier fighter after top tier fighter with the same looks, time and time again. Size hasn’t bothered him, reach hasn’t bothered him, power hasn’t bothered him—he beats almost everyone with the exact same techniques and looks good doing it. In his fight with Urijah Faber, Edgar made the California Kid look plain clumsy. Edgar drew out Faber’s intentions, recognized them, and adapted to exploit them throughout the fight. In round one Edgar got to work scouting—a couple of feints and it became apparent that Faber wanted to check hook almost every time it seemed like Edgar was going to step in. So the feints kept coming. Every time Faber stepped in with his overhand, Edgar caught it on his forearm or rolled it off his shoulder and came back with an uppercut as Faber’s head was well forward of his centre of gravity. That fight remains simply one of the best examples of adaptation and exploitation on the fly in a high level mixed martial arts bout. In Edgar’s most recent bout, against Jeremy Stephens, the former lightweight champion seemed even more dwarfed by his opponent than usual. Against a thunderous hitter with stern takedown defence and the ability to drag himself up from under most people, Edgar turned up and did his job just as well as usual. From the get go Edgar was circling and feinting, drawing out missed swings from Stephens and putting in real punches when he felt he had the chance. More than any technical touch or physical attribute, Edgar’s greatest skill is his ability to anticipate his opponent’s thinking. Watch any Frankie Edgar fight and you will see feinting, striking and takedowns all used in combination—and more often than not when Edgar steps in for strikes he finds the mark and when he steps in for the takedown he gets his man to the mat. Edgar fakes out Stephens, attempts to put in a right hand to the head, then digs a right straight to the body. Edgar convinces Stephens that he isn’t going to engage, then bangs the body. Stephens’ sole moment of effective offence came as he caught Edgar with his hands low on the end of a jumping switch kick. Edgar got on his bike for the best part of a minute, retreating or circling out from every attempt Stephens made to engage and looking wobbly on his feet. Suddenly Edgar stepped in to meet Stephens and bested him in a quick exchange on the inside. Edgar continued to run, feinted as if to engage again, and then hit a picture perfect level change as Stephens was convinced he would be obliged with another exchange. Again, nothing about the specific techniques was special, it was simply Edgar’s brilliant fight psychology—anticipating perfectly when Stephens would start opening up and exposing his hips just in time to hit that takedown. Most of what Edgar does is work on straight lines. He moves laterally when the opponent is coming to him, and around the opponent if they are stationary, but his offensive striking comes in running flurries. What Edgar does perfectly is utilize level changes in his striking—banging the body and the head and bending at the knees to do so, in order to better disguise his takedown attempts when they come. In both of Jose Aldo’s fights with Edgar, it was pivoting off line that left Edgar running past Aldo and looking confused. Oddly enough, Edgar found the key to winning the striking in both those fights as he kick the back of Aldo’s exposed leg when Aldo pivoted, but he abandoned it in both fights for seemingly no reason. If Edgar can catch his man starting to retreat, he can lighten the lead leg by slamming his lead hand into the shoulder or neck, and pick up his signature single. This in turn pairs wonderfully with his jabs and body jabs. Often Edgar will change level and jab to the body, or change level and jab upwards. If at any time he switches that jab up for a stiff arm into the shoulder he’s on that single again. This frustrated B.J. Penn endlessly in their second match. Edgar’s next opponent is a young gun in the featherweight division: Yair Rodriguez, and it isn’t quite clear whether Rodriguez is the next big thing or the flavour of the month. Rodriguez’s last victory was a brutal and one-sided knockout against the ghost of B.J. Penn, but that told us about as much about Rodriguez as Edgar’s last fight with the aged B.J. Penn told us about Edgar. What everyone does know about Yair Rodriguez is that he kicks a lot, and he spins a lot, and even if he is missing eighty percent of his strikes he can keep doing it for five rounds at a frantic pace. Some suspect this could be problematic for Edgar because of the Stephens jumping switch kick—Rodriguez already has a knockout by jumping switch kick and uses them all the time. And it is true that Edgar does often get into boxing matches with his opponent in the stand up and carry his hands a little low when he is outside of his own punching range which could leave him exposed to high kicks if he is feinted into retreat before the kick is thrown. More significant, however, is Edgar’s difficulty with low kicks. Because of his longer stance and constant movement, Edgar doesn’t often check kicks and instead retreats from them or attempts to catch them. Chad Mendes was able to take Edgar out of his stance momentarily with every low kick he threw. Benson Henderson had good success with low kicks against Edgar and might well have been the last southpaw Edgar faced. Rodriguez switches stances a lot but kicks into the open side can be a real killer particularly for the smaller man. Edgar has had decent success catching the leg on low kicks and body kicks but often does little with the leg once he has it. This is an enormous step up in competition for Rodriguez who goes from picking up an easy paycheck against B.J. Penn to facing probably the second best featherweight in the world right now. Watching Rodriguez’s fights it is very clear that he is still a rough diamond. His boxing is looping and sloppy: he throws himself off balance, leading with his face and performing front crawl in the air with his head down. And he often retreats straight onto the fence or runs clean past his opponent to wind up on it. Typically in an ‘experience versus youth’ fight, it is these kind of tactical errors which allow the older fighter to grab a hold of minor advantages and hold them for minutes at a time. If the youthful fighter is one who likes to spin for kicks and backfists so often that it is no longer a surprise to anyone, it can result in him dropping rounds by letting his opponent grab his back far too easy. Uriah Hall versus Robert Whittaker is a perfect example of this: every time Hall showed his back, Whittaker stuck to it and won two minutes of the round comfortably with the judges. While Rodriguez could benefit from jumping on Edgar early and hoping for a finish, it would be good to see him settle down and take his time. Often his hyperactivity doesn’t help his cause. Throwing more kicks and spinning techniques does not result in better connections—setting them up does. By the second round of his fight with Rodriguez, Alex Caceres had realized that he was better off just retreating any time it looked like Rodriguez was doing anything. Distance kills every strike you can name, Rodriguez needs to find some ways to make smart fighters stand in front of him and eat strikes rather than just throwing enough at the wall that something sticks. There might not be a need to overcomplicate this fight for Rodriguez, if he is confident enough to kick comfortably the simple southpaw double attack of left body kick and left high kick could well be enough to work over Edgar and eventually land a flush high kick. Left kicks to the inside of Edgar’s lead leg might be used to draw him out of his stance and land free follow ups. The front kicks to the head he was bringing out against B.J. Penn might also be a good idea given Edgar’s short stature and relatively low stance. Jose Aldo famously snapped Edgar’s head back with a front kick but didn’t attempt it again. Edgar excels at winning exchanges in the pocket, always getting down behind a forearm or shoulder and moving his head throughout, but he has to get so close in order to do so that Rodriguez might look to connect intercepting elbows on Edgar’s usual straight line running flurries. Given Rodriguez’s love of knees and Edgar’s height disadvantage it might be interesting to see if Rodriguez can slap on the double collar tie effectively from boxing range. Edgar doesn’t tend to hang about in upright clinches along the fence so it seems like Rodriguez angling out and using it there might be a little much to hope for. A weapon which could be of good use in this fight is the low line side kick—we have discussed Rodriguez’s use of this before and how it is not conducive to setting up his other techniques. Rodriguez will draw back his knee to his chest and try to stamp on the opponent’s knee as hard as possible. Compare that to Lando Vannata’s method or Conor McGregor’s performance against Max Holloway. Both Vannata and McGregor lazily put the low line side kick out there without much telegraph and more as an annoyance to build off. Rodriguez’s kick makes opponents run a mile as soon as his knee chambers. 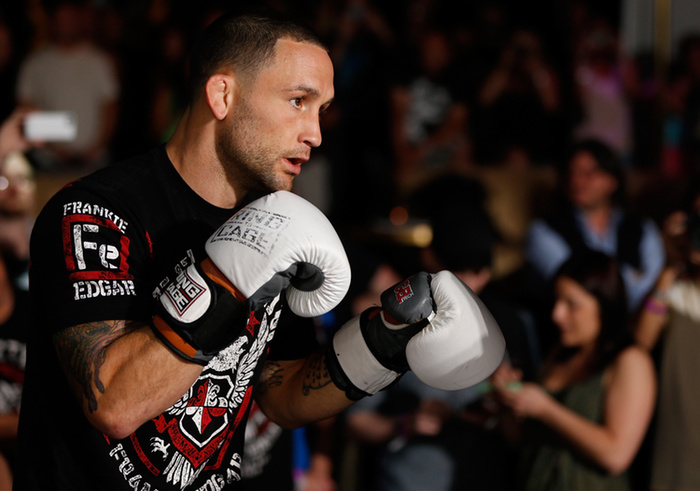 A short, lazy, placed rather than pumped low line side kick could be a real pain for Frankie Edgar to get around. Not only are they hard to grab because they come in so low, as Bruce Lee said they apply the longest weapon into the nearest target—what better for a man with a height and reach advantage and who loves to kick? For Edgar an exaggerated distance might be useful in this fight. Edgar normally floats around just outside of his opponent’s punching range and steps in with flurries. Hanging around within kicking distance might not be a great idea against Rodriguez. Standard procedure with a good kicker is to 1) keep them backing up or 2) draw them out and step in once they have already kicked. The general rule is to always be all the way in or all the way out—too close or too far to be kicked comfortably. Rodriguez is unlikely to tire himself out by kicking if he was happy to throw two hundred leaping strikes against Alex Caceres, at altitude, so it would be good to see Edgar retaliating and punishing the kicks early and often rather than treating them as something to be defended while he is attempting his usual circling and boxing. Rodriguez has a habit of charging his man with little control over his weight, drawing him into one of these charges could allow Edgar easy opportunities to turn Rodriguez onto the fence and either take him down or attempt to grind and dirty box along the fence—though that has never really been an Edgar forte. While Rodriguez has the tough ask of taking on one of the best to ever play the game, he makes a tough match up for Edgar. He is a taller, longer fighter whose favourite weapons are the longest available. Many of Edgar’s opponents come in hoping to punch him and Edgar can draw them forward, duck inside their hands and counter or attempt to level change onto their hips. Ducking in on an opponent as he is kicking is a lot harder to time and considerably more dangerous. A mistimed level change from Edgar and he could eat a knee from Rodriguez while he is flinging out a tempest of kicks and spins. Accidental or perfectly timed and intentional: a knee to the head is a knee to the head. Between the old guard of Jose Aldo and Frankie Edgar, and the new blood of Max Holloway and Yair Rodriguez, a lot of interesting stuff could happen in the featherweight division over the next few weeks. Make sure to watch Frankie Edgar and Yair Rodriguez square off at UFC 211 and get back here to Fightland for all the post fight goodness.